Salford Priors is situated in a rural area of open farmland where agriculture is still important, especially the growing of soft fruit, asparagus and salad onions. The area along Evesham Road and Station Road is in a Conservation Area. 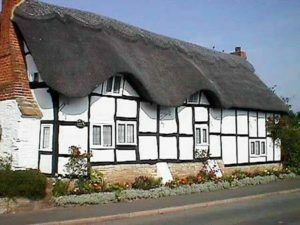 There are a significant number of attractive properties of 16th and 17th century, with timber-framed walls and thatched roofs; and there are several between the old railway station and the church. The village is very popular and well photographed, especially in the summer months, when it is in full flower bloom, paid for by Salford Priors Parish Council. 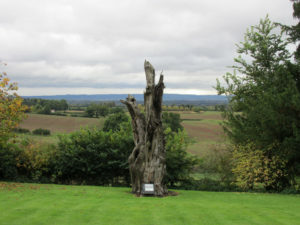 The village was won the Warwickshire Village of the Year Competition. Park Hall on Tothall Road is an elegant Victorian house built in 1880 by William Tasker in a Queen Anne Style and constructed in red brick beneath a hipped roof. The house was formally The Dower House to the Ragley Hall Estate. In 1988 it was converted into luxury apartments, retaining most of the interior period features. Salford Priors is first recorded in 714 AD as Saltford, because it was a ford crossing the River Arrow on the Salt Way from Droitwich to Hillborough. By the time of the Doomsday Book of 1086 the parish was known as Salford. The Priors part of the name came from the early possession of lands by the Kenilworth Priory. The parish church of Salford Priors is dedicated to St.Matthew and sits at the bottom of the village, close to the River Avon. There has been a church on the site since the Norman Conquest and it is mentioned in the Doomsday Book of 1086. The Norman influence can be seen from the moment you enter the church with the carved stone arch and the different patterns. It is protected by a Victorian porch with a wrought iron gate, which was put there to keep out the sheep. Another feature of interest is the large ‘flamboyant’ window in the centre of the north wall of the nave. ‘Flamboyant’ describes the Gothic architecture popular in the 15th and 16th centuries, and this window is one of only about 12 to be found in England. In the beautiful churchyard there are some entertaining medieval gargoyles and the unusual semi-octagonal tower attached to the church which may have been used as a beacon tower to guide travellers across the (often) flooded meadows and the rivers of Arrow and Avon. There are eight bells in the tower which have rung out across the village since the 18th century. The clock at St. Matthews is unusual in that it chimes every quarter of the hour. Inside the church are to be found two plaques that commemorate the people of the parish killed or missing in both World War 1 and World War 2. There is a large car park in front of the church for the use of visitors. The railway came to Salford Priors in 1866, a section of the Evesham to Alcester line. With the coming of the railways transport of local products to major cities and markets began. The original station buildings still stand and now form part of the industrial estate. The railway line closed completely in 1964. The village school was originally founded in 1636 by William Perkins as a Free School for all the children of the parish. Today, the Salford Priors Church of England Primary School in School Road is a modern teaching establishment. Salford Priors Memorial Village Hall was built in 1955/56 and opened in April 1957. It was funded by public subscription and is held in trust for all the inhabitants of the village. The Hall was built in memory of those who gave their lives in the two World Wars of 1914-18 and 1939-45. There is a public house in the village called The Bell Inn, located on the Evesham Road. Wood Bevington is a small collection of properties with the Grade 2 Listed Wood Bevington Manor at the top of the hamlet. Weethley is situated on a hill, close to the Evesham Road and on the western edge of the Ragley Estate. It is a very small hamlet and what is extraordinary is that it has its own church that stands upon high ground with superb views right over to the Cotswolds and as far as the Malvern hills. The church at Weethley is dedicated to St. James and is a ‘chapel of ease’ to Holy Trinity at Arrow and is in the gift of the Marquis of Hertford at Ragley Hall. The two parishes were merged in 2004. The church of St. James was built in 1857 of lias stone in the 13th century style. In the churchyard there is a vast base of a dead tree amongst the gravestones, several metres across and pre-dates the church. St. James Church seems to have a special spiritual and peaceful atmosphere that ramblers passing by regularly comment on. There is a small amount of parking around the church. Two other notable properties in the hamlet are the farmhouse of Church Farm, which is a brick building with 17th century timber framing and is possibly the oldest in the hamlet. The other property is the Grade 2 Listed Old Rectory, a handsome detached building from the 16th century and partly rebuilt and restored in 1866.